I got my hair cut yesterday on Sunday. Normally I will have my hair cut once a month so I gonna find a saloon that is cheap and suit my taste and I found this. 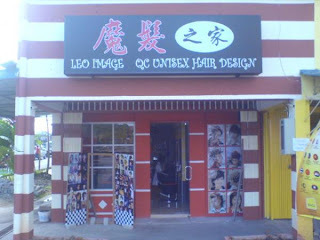 Leo Image QC Unisex Hair Design at Green Road, Kuching. Something that attract me in the early visit was the way he clean up after hair cut. This hair dresser very concern about your hair. 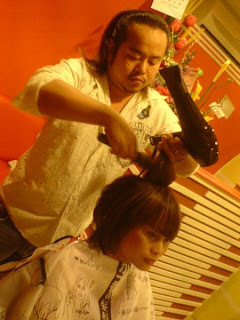 He will try his best to advice you for the best hair style to suit you and the best way to keep your hair. His name is Leo. I went there for several time since early this year. Somebody was introduced me to tried it out and it cost RM8 only per hair cut during their promotion and I found that it just so so at first but slowly he pick up my hair style and yeah...he win my heart...for my hair style la. Leo using trimming cutting style to get your hair done and I like the way it look after cut because it look a little bit untidy and i like the style. He didn't wet your hair before shorten your hair and even finish, he only blow your head and use the same cloth as per others, yeah...blow and clean only. You might felt a bit not comfortable at first but that's his style. Any stylish design he can do. *the photo that I took from this angle didn't really show my hair style. Poor photograph. Normal hair cut cost only less than RM15, and mine yesterday cost only RM12. Don't worry...they have air-con and good sound system to make your bored away. They are doing something new now, promoting by giving customer their VIP member card with Rm1 only. The purpose for doing this is because they want their customer to have the same price everytime they make a visit. Due to increasing price of goods and fuel which is unpredicted in the future, this is a very good offer. RM1 per VIP card and this offer only valid on next year. Maybe because it's dry cut? According to professional and experience hair dresser, dry cut is better than wet and it show the level of professional coz it's not easy. He just came back from S'pore, you know...price before really get famous. If he become famous one day...holy cow, i don't think it cost that much only.